A daily football writer who left his role for a new job this month has been named Regional Journalist of the Year at the British Sports Journalism Awards. Chris Wathan, formerly of Media Wales, won the prize at a ceremony held in London yesterday – the same day he began his new job with BBC Wales. 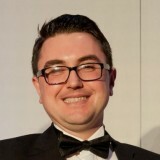 Chris, pictured, previously spent 10 years with Media Wales – which runs titles including the South Wales Echo, Wales Online and the Western Mail. Neil Allen, from Portsmouth daily The News, and Mark Douglas, from Newcastle daily The Journal, were highly commended in the category. The awards, run by the Sports Journalists’ Association, were presented at a ceremony attended by more than 500 guests. Chris told HTFP: “It’s a lovely way to sign off from my time at Media Wales where I always felt proud and privileged to work and cover some great times in Welsh football. I’ve been spoilt with some of the stories on the patch and with the support I’ve had from colleagues to tell them. “The messages I’ve had since have been quite overwhelming and left me smiling after a great evening. It’s always quite inspiring to see some of the sports journalism produced throughout the year highlighted on the night. Newsquest Specialist Media publication Boxing News also triumphed in the Special Sports Edition category for its ‘100 Greatest British Boxer’s supplement – beating national competition including the Daily Mirror, The Independent, The Sun and the Daily Telegraph. In his acceptance speech editor Matt Christie, who was also highly commended in the Specialist Sports Correspondent category, paid tribute to the memory of boxer Scott Westgarth, who died after winning his contest on Saturday. Boxing News also won in the same category last year, when its Muhammad Ali tribute issue also received the award.